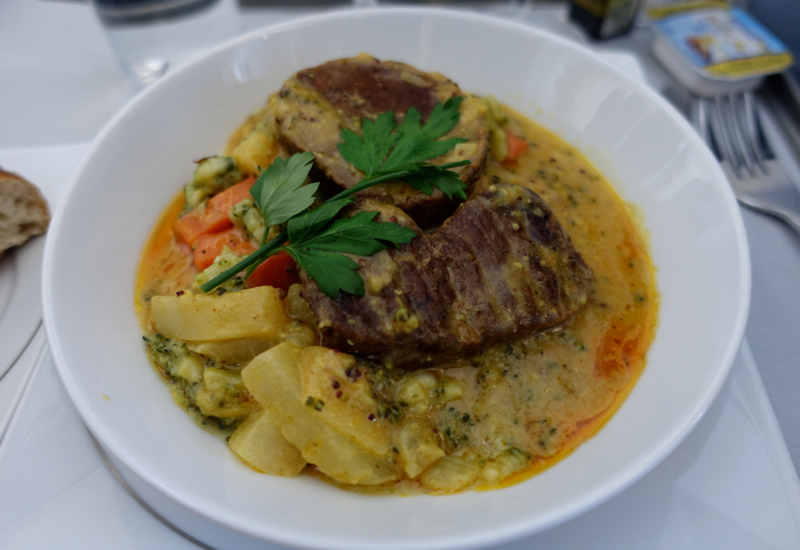 This Airberlin Business Class A330 Review from Berlin TXL to NYC JFK is part of a trip report including Berlin, Vienna, and luxury hotels and dining in Moscow and St. Petersburg, Russia. 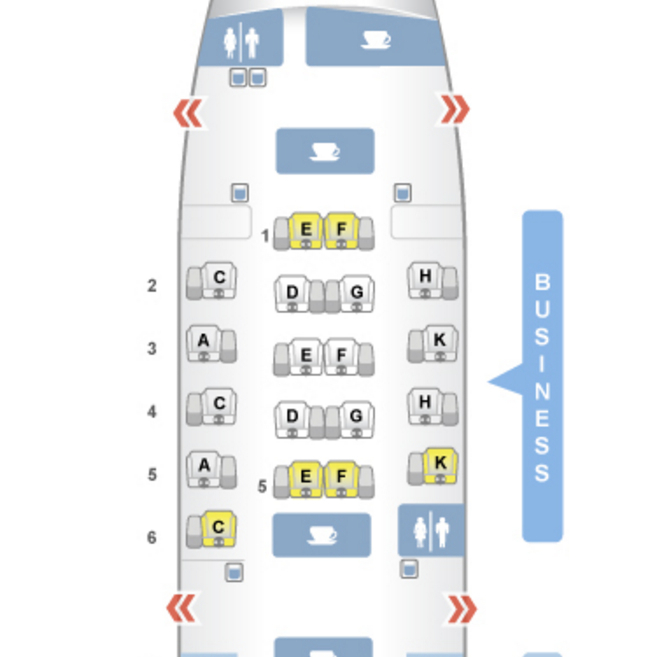 Air Berlin actually has 2 different business class seat configurations on the A330. 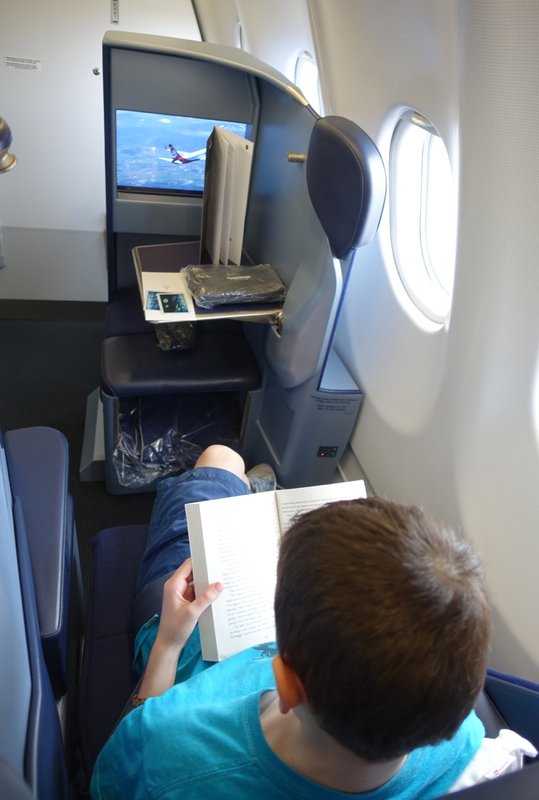 On the way over, we were in the conventional one that shows up on SeatGuru, where 3K is a window seat. For this type of business class cabin, I recommend selecting a window seat in an odd row, namely 3A, 5A, or 3K as it's more private and you're less likely to be disturbed by aisle traffic (with the exception of 5K, which is in front of a lavatory and which I'd avoid). On our Berlin TXL to NYC JFK return, however, we had the opposite Business Class seat configuration, where 2K is a window seat and 3H is an aisle seat. 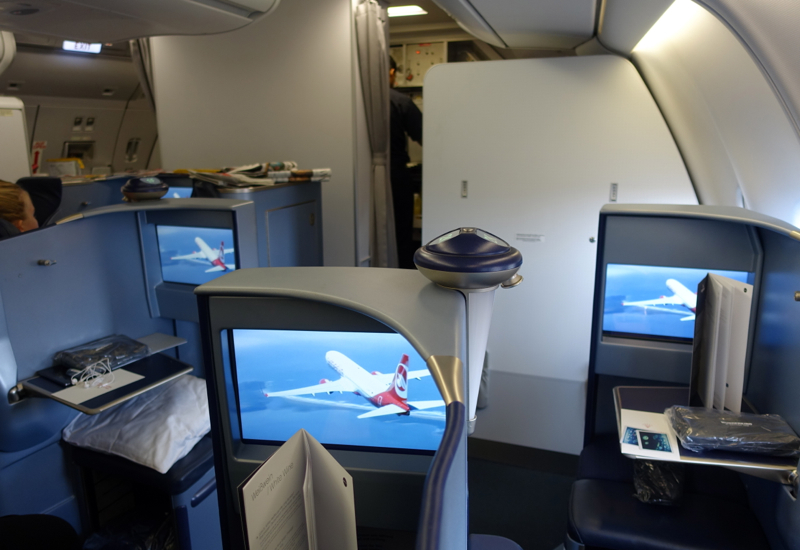 For this type of business class cabin, I recommend 2A, 4K, 2K or 4K. It was only thanks to a kind and expert supervisor that we were able to get our window and aisle solo seats back, one behind the other, since even though we'd long ago pre-selected our seats, Airberlin moved us to 1E and 1F, which we definitely didn't want. As I wrote in If an Airline Changes Your Reserved Seat Can You Get It Back? Airberlin is notorious for moving your seat, even if you pre-selected it–it's especially likely to happen in the case of two passengers traveling together if you selected window seats one behind the other, as we normally do for seat configurations such as Air Berlin's, where all window seats are solo seats. Since our reason for choosing window seats is because my son loves looking out the window so much, I seated him in 2K, right by the window, which he was very happy with. 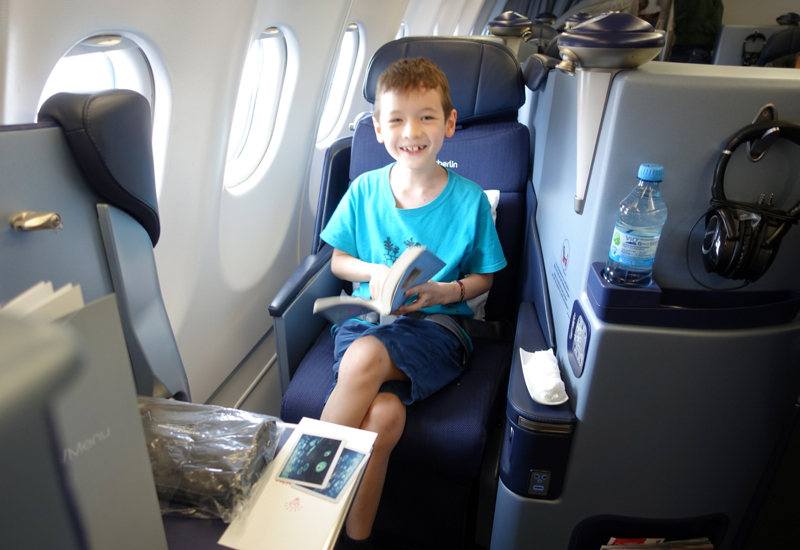 While he was good about being in his own seat even when he was 4 (see Cathay Pacific First Class Review Hong Kong to New York) it's definitely even easier now that he's 7 and can read his own books before the IFE is turned on or when the system runs out of films he's interested in. Air Berlin's seat is quite narrow, at only 20 inches (this is a low cost carrier after all and not Singapore Business Class) but given the space constraints, is comfortable enough. 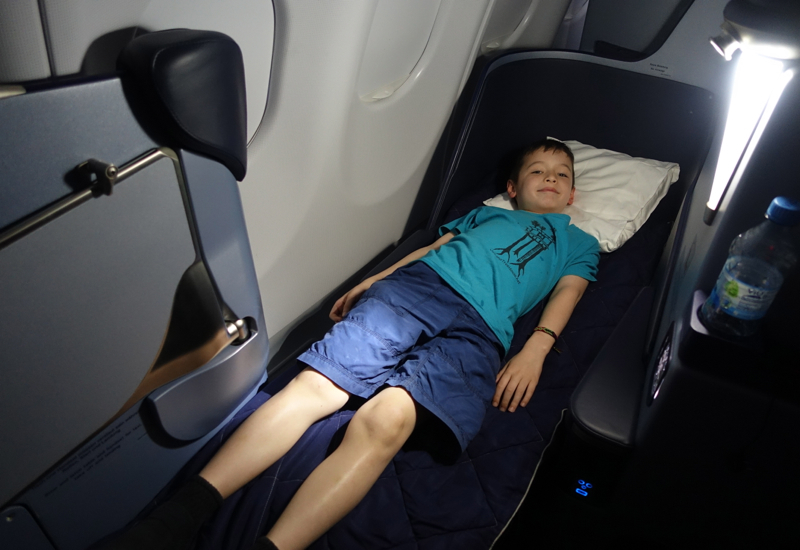 I prefer it to British Airways Business Class because the product is newer and the ottoman that forms part of the flat bed is firmly fixed and not flimsy. 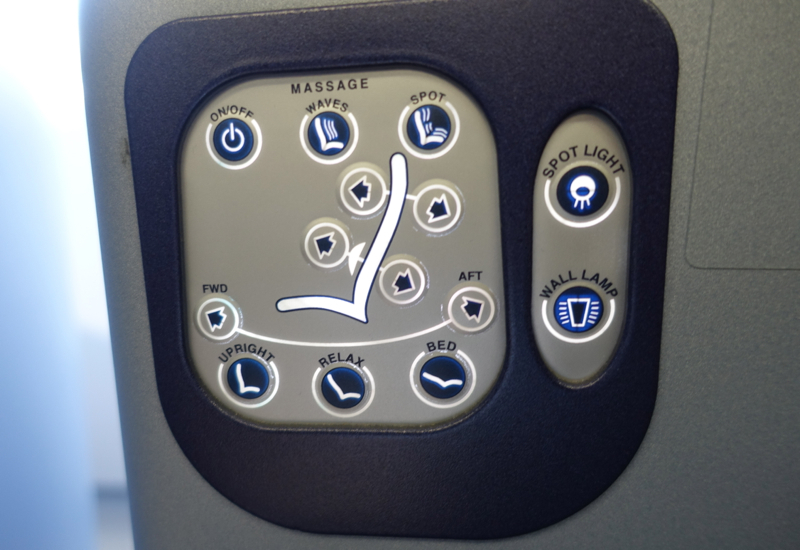 The seat controls are easy to operate, although I have yet to be able to detect the ostensible massage function on any of the four seats I've tried it on. 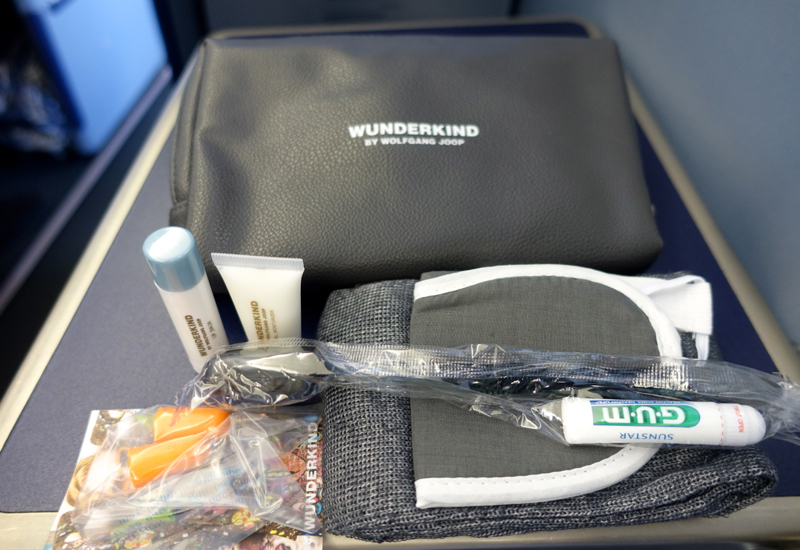 On our return flight, the amenity kit was in a gray “Wunderkind” case by Wolfgang Joop instead of the black Tumi kit that we received on our JFK to Berlin flight. I liked the Tumi case better than the cheap looking Wunderkind case, but both had the essentials: toothbrush and toothpaste, moisturizer, lip balm, sleep mask, socks. Overall these are not amenity kits hat most travelers will keep, unlike, say, some of the nicer first class amenity kits from Singapore Airlines, Cathay Pacific, Emirates, Asiana, etc. 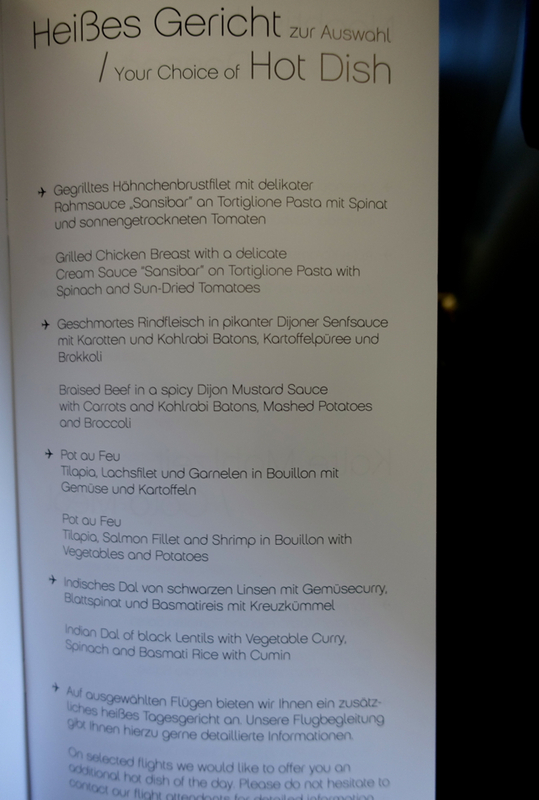 Air Berlin always has the Business Class menu and amenity kit already on your tray table when you board, saving the cabin crew time in handing these out but also making the service a bit more routine and less personalized. 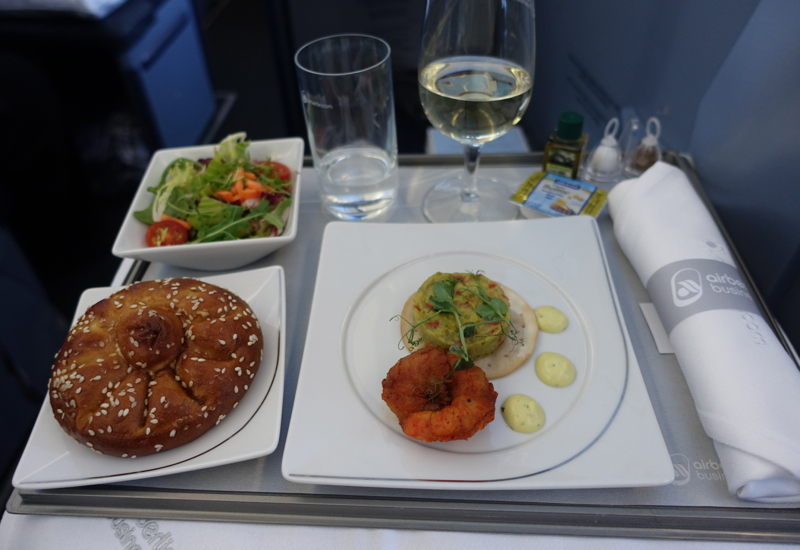 The tandoor shrimp appetizer was good, though as with the lobster medallion salad appetizer on our other flight, somewhat overcooked and a stingy portion of 1 shrimp. The pretzel roll was warm and delicious, however. 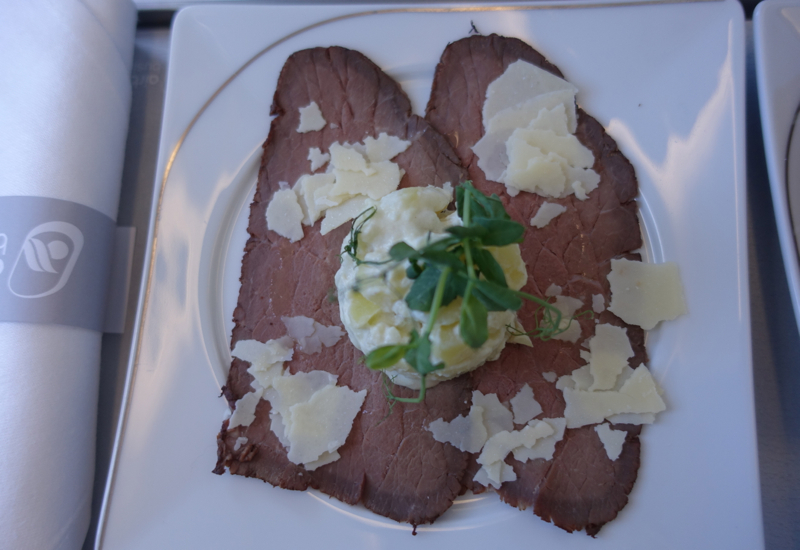 My son's roast beef carpaccio with parmesan flakes wouldn't have appealed to me at all, but he seemed happy enough with it. My main course of Braised Beef with Dijon Mustard Sauce wasn't bad, but wasn't that good either, and I didn't finish it. 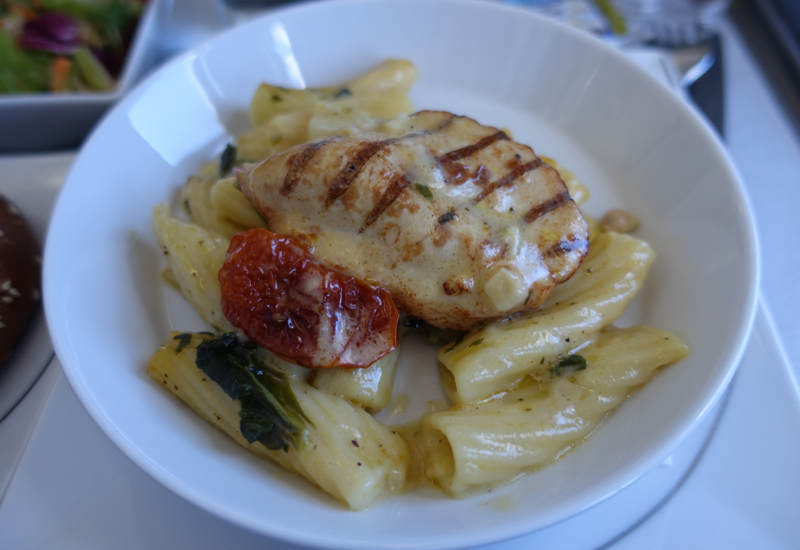 My son's choice of Roast Chicken with Pasta, Spinach and Sundried Tomatoes was tastier. 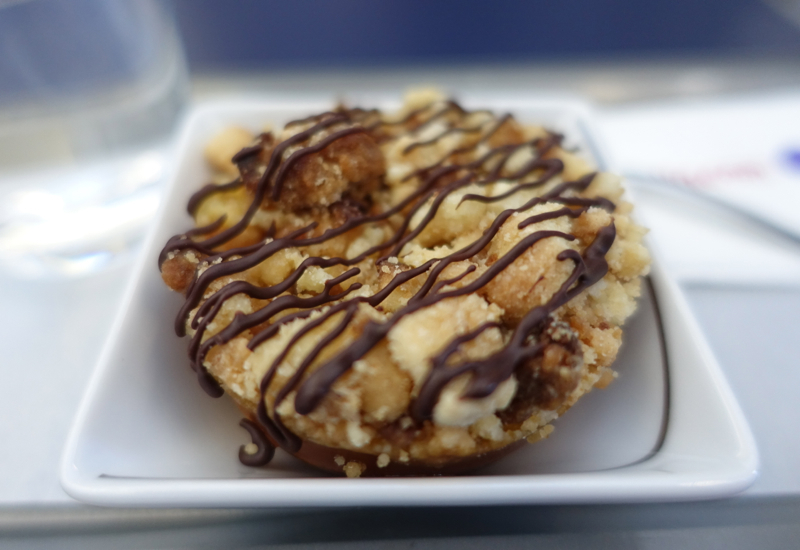 The dessert was a Caramel Apple Tart and quite dry–it would have benefited from some vanilla ice cream or whipped cream. 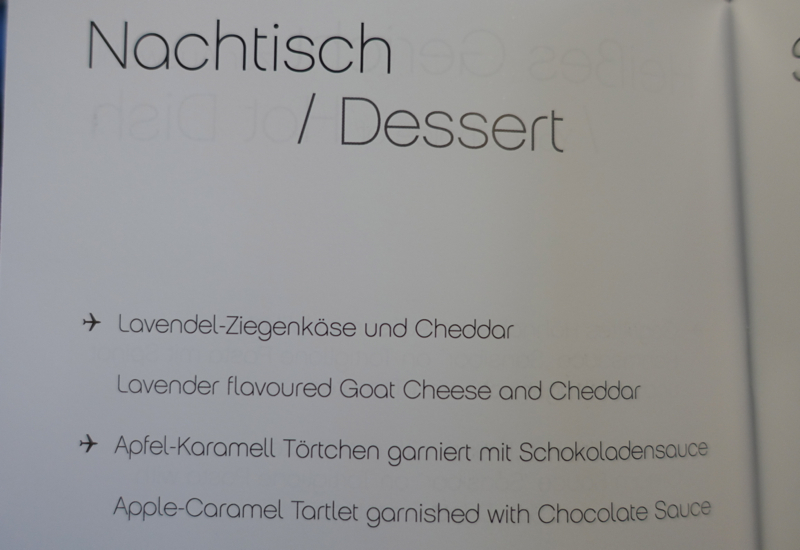 Similarly, the cheese plate that my son tried was merely cheddar cheese and some kind of mild herb cheese and wasn't nearly as good as the one on our outbound Air Berlin flight from JFK to Berlin. 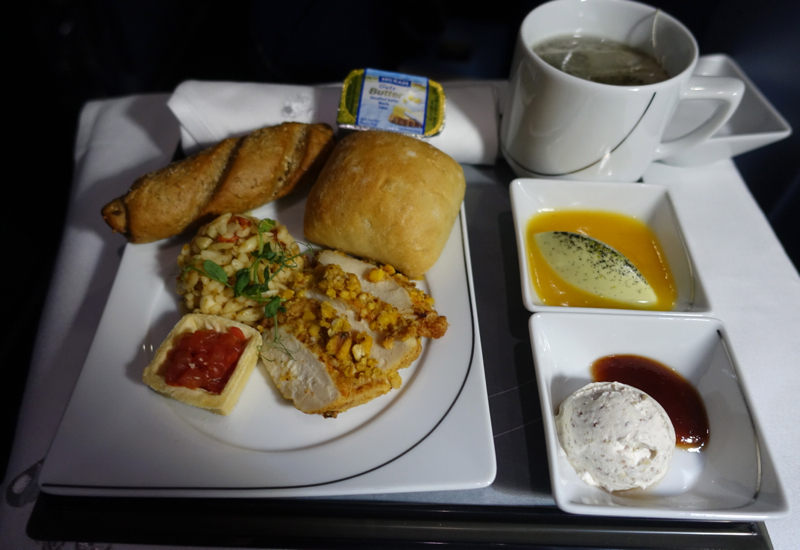 It consisted of corn crusted chicken with orzo salad, pistachio panna cotta, and hazelnut cream cheese with grape confit. While this was a daytime flight, due to the time difference with Europe, we and many other passengers rested part of the flight. The Air Berlin Business Class seats do recline 180 degrees, meeting up with the ottoman to form a fully flat bed. As I've noted in my other review and posts however, the bed is not that long: less than 6 feet. This wasn't an issue for me or for my son, or even for my tall husband flying back on a day-time flight. But it's something to be aware of if you're 6 feet or taller and like to sleep fully stretched out. As before, I used my duvet to provide a little padding, since of course there's no mattress pad. 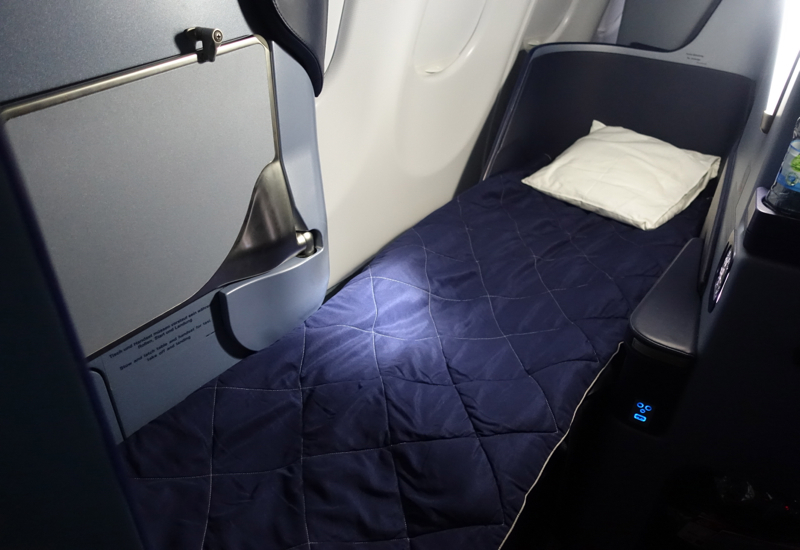 As far as I know, only JAL Business Class provides a nice thick mattress pad in international business class, though there may be some other products that provide a thin one. 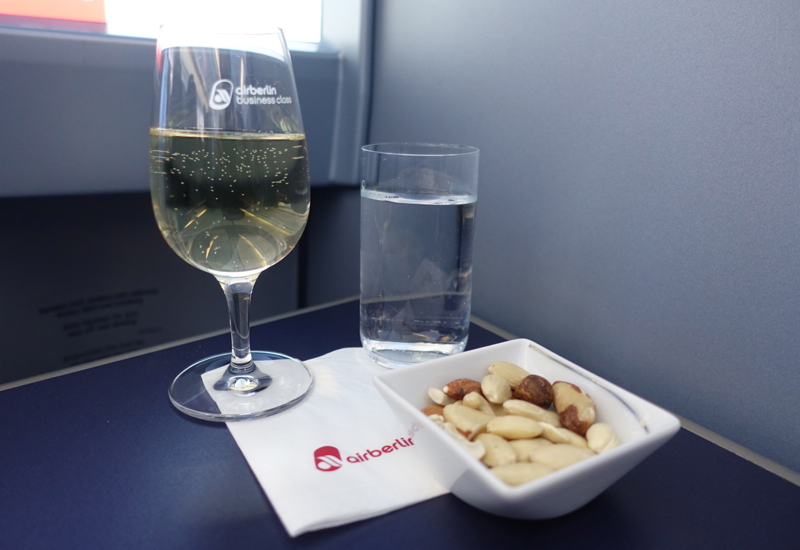 This time around, I knew what to expect for Airberlin Business Class. Business class seats are on the narrow side, but quite private if you manage to get a window seat, as opposed to an aisle seat. As before, depsite the somewhat impersonal beginning (less interaction with the crew, due to the menu and amenity kit already on your tray table) the staff proved to be very professional and friendly. One of the German crew members even practiced his Russian on me once he saw the DME tag on one of my bags, telling me that he was studying the language and hoped to work on Airberlin flights to Moscow, at least until I told him I was actually American. 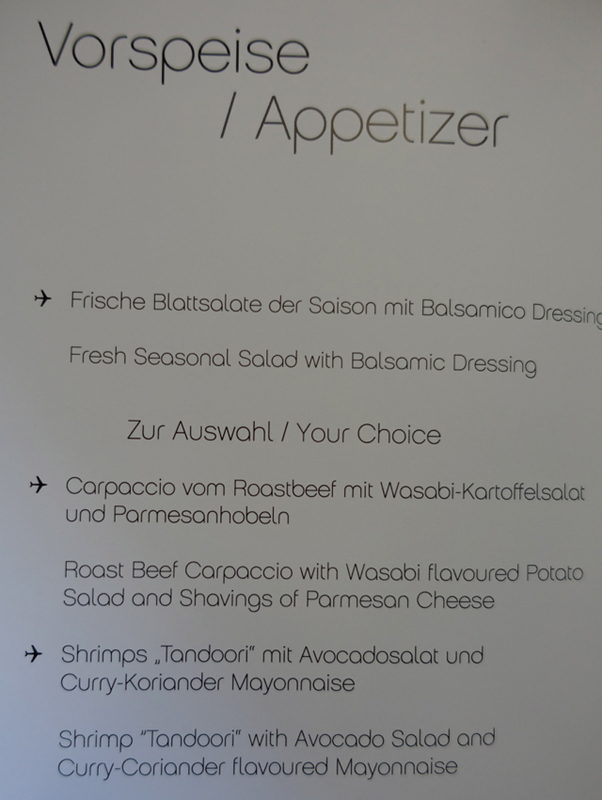 The food is a bit mixed, but the pretzel roll at lunch and the cold meal were quite good for a business class offering. 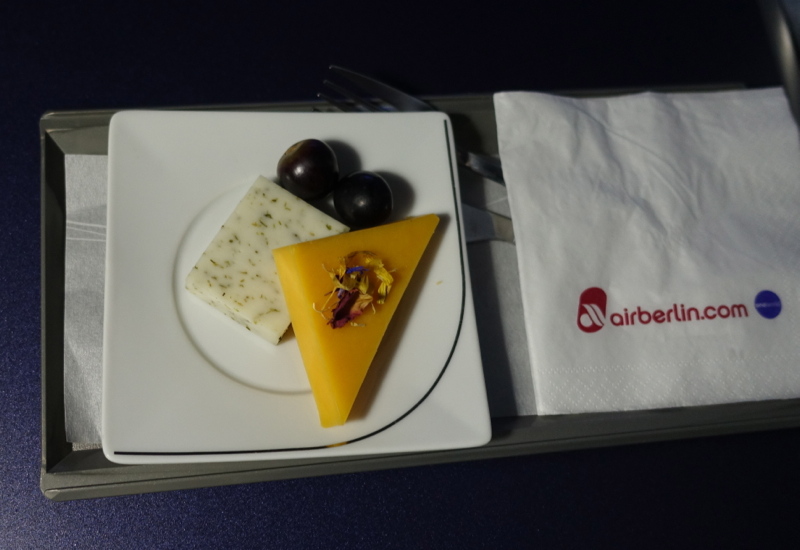 Overall, Airberlin provides a comfortable flight between the U.S. and Europe, and is an especially good as an award ticket with no fuel surcharges.